Bobbs Out: Whos In Now? Detroit Public Schools has been under an Emergency Financial Manager since 2009 when then-Democratic governor Jennifer Granholm hired Robert Bobb to balance the books. The official story is that the school board was not managing its finances and was going into debt. Soon after, however, Bobb began to take control of all aspects of the district. The school board was stripped of its financial resources, so there was no way to sue the Emergency Financial Manager (EFM) for overstepping his boundaries. Eventually, George Washington’s firm stepped up and has represented the school board through these dark days. The Board won the right to academic control last year (see Wayne County Judge Wendy Baxter’s decision). Soon after that decision, the new governor and legislature changed the law, voiding Judge Baxter’s decision. Few rules apply to EFMs. They can hire their friends, as Bobb has done. They can travel endlessly and work part time on wages teachers could only dream of. They can buy 40 million dollars worth of books and then close half of the schools. Now Bobb is proposing to close dozens of schools and convert dozens more to non-union charter schools. The deficit is much larger due to his financial malfeasance. Now students have to bear the burden of Bobb’s deals with contractors and endless consultants. Detroiters are so angry about this situation that there is little room for rational discussion about DPS.Detroit taxpayers built the new schools with bond money, and then had it taken by Lansing and doled out to the contractors they chose. The Skillman Foundation has a lot to say about where new schools will be built. Few black contractors have received the bids. No bids are taken on contracts for anything now; the EFM has all the power to set contracts without answering to anyone. Elected officials cannot meet without advising the public of our intentions. An agenda must be posted 72 hours in advance of any meeting where a quorum will meet. The elected School Board now has absolutely no power to spend money or make decisions on issues like school closings, which have devastating effects on our neighborhoods. Families make all of their decisions around where a child will go to school. Yet, schools can be perfectly functional and be on a closing list. Then they’re off, and there is no rhyme or reason. Parents get frustrated or scared and leave. Principals are caught cheating on test scores so their schools won’t close. Teachers are threatened if they fail students who are actually failing. School is a joyless, never-ending round of testing and pressure. Real educators are leaving in droves because of it. Students are last on the agenda, treated as pawns in this high stakes game. Money is now being handed off to charters, which operate in secrecy. This is the front line of the struggle. People in Detroit know this. 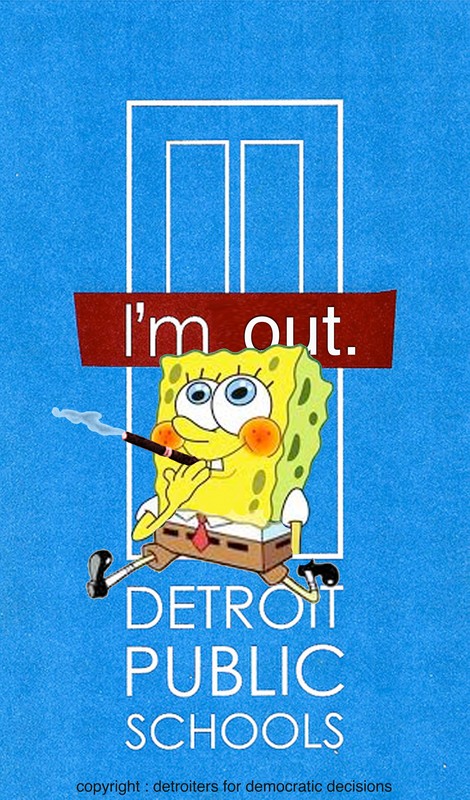 People outside Detroit think it’s the fault of the Board. The Board has had control for less than 2 of the last ten years. Parents with children in the schools, those who work in the system, and the school board members know the real story, which the media has replaced with demonizing portrayals of public education. Only very strong, determined and disciplined acts of resistance can combat this campaign. In districts where the majority of the students are poor and black and brown, all bets are off. The mass media has carried out the mission of the corporate interests to convince even us that we cannot govern ourselves, and our children are safer with the charter operators than an elected school board and real teachers. Teach for America and the foundations have high-jacked public education and they have their own plans for our youth. Only we can change this. Stay tuned.